DFWstangs Forums > Vendors > CARiD.com > Save up to $150 on Corsa Products with new offer at CARiD! Corsa is among the most respected brands on the market of performance exhaust systems. Every Corsa system features a patented reflective sound cancellation (RSC) technology, which was developed to eliminate exhaust drone while cruising. Take advantage of the new offer on Corsa exhausts! 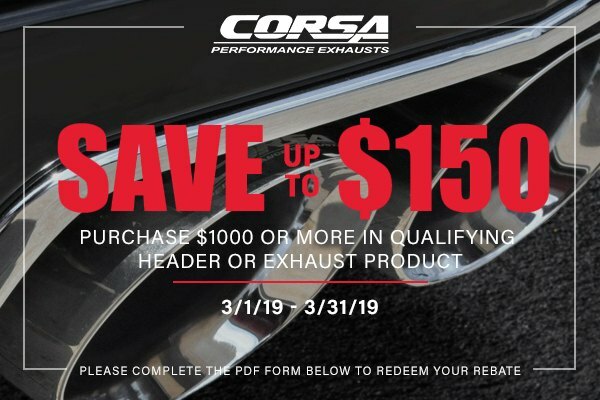 Receive up to $150 mail-in rebate for qualifying Corsa Header or Exhaust Products valued at $1000 or higher. The offer is valid till March 31, 2019. Please fill in the following PDF form to get your rebate. Last edited by carid; 03-14-2019 at 07:29 AM.